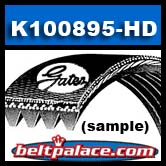 GATES FLEETRUNNER® K100894HD Automotive Micro-V Belt. K100894HD Automotive Micro-V Belt. GENUINE GATES™ FLEETRUNNER® K100894-HD Belt. Outperforms all competitors. Outstanding crack resistance at extreme temperatures. Designed for the toughest applications; a real problem-solving belt! The only one of its kind in the market and used by fleets worldwide. 10 Rib "K Section" Width - 1.367" (35mm).